Fontina is a creamy, semi-firm Italian cheese that comes from cow’s milk. Although there are quite a few cheeses that have similar names (e.g., Fontella, Fontal, Fontinella, etc. ), only the Italian Fontina — known as “Fontina Val d’Aosta” — can lay claim to being designated as the original Fontina cheese. True to its rich history, Fontina Val d’Aosta is made from unpasteurized milk that comes from the Valdaostan Red Spotted cows that graze in the Aosta Valley, a mountainous region in northwestern Italy. 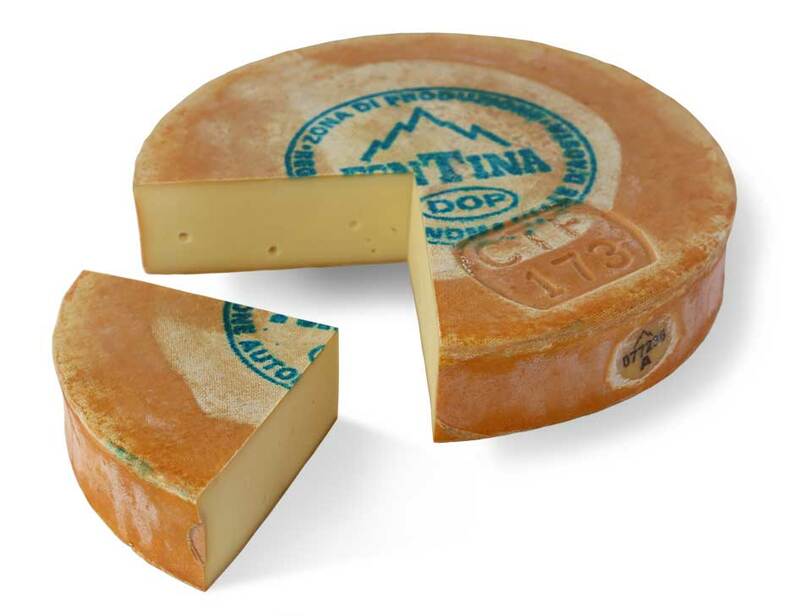 Fontina Val d’Aosta typically features a pale or light yellow interior that is dotted with several tiny holes (“eyes”), and its rind is a tan to golden brown color that usually gets darker with aging. Thanks to its creaminess and nutty, buttery taste, Fontina is remarkably versatile, and is often used in fondues and other similar dishes. In addition, Fontina is an excellent table or dessert cheese, and can add a burst of flavor to sandwiches as well. It is impossible to explain the history of Fontina cheese without talking about the region from which it originated. Named for the tiny village of Fontinaz in Italy’s Aosta Valley, Fontina cheese has been produced in that area since the 13th century. Although the word “Fontine” does not show up in print until the year 1717 (as a line item in an accounting journal for the Gran San Bernardo Hospital), feudal archives of the region explicitly mention cheeses some 500 years earlier. Even the artistic renderings of the day confirm that the production of Fontina was alive and well — for example, if you pay a visit to the Issogne Castle in the lower Aosta Valley, you will see frescoes depicting medieval life, one of which features a vendor at a stand selling Fontina cheese. The process by which Fontina is produced is so uniquely intertwined with its area of manufacture that it was one of the first cheeses to be awarded a DOP (Protected Destination of Origin) designation by the European Union; this means that only cheese made from the milk of cows from the Aosta Valley can qualify to be labeled as “Fontina val d’Aosta” cheese. These strict production standards ensure that the quality and character of the product will remain faithful to its rich tradition that has been handed down throughout the centuries. Besides being one of the most picturesque places on the planet, the Aosta Valley in the Italian Alps offers extraordinarily lush, high-altitude pastures that provide nutrient-rich grasses for the famous Valdaostan Red Spotted cows that graze there; these cows produce the milk from which Fontina is made. Bear in mind that this milk is incredibly rich due to the purity of the fodder that these cows are allowed to eat, and this richness definitely carries over into the flavor of Fontina cheese. Diligent cheesemakers milk the cows daily, and make Fontina cheese twice a day from milk that is no more than two hours old. After cooking the milk and adding rennet (curdled milk from the stomach of a calf) to the mixture, the cheese is then aged and allowed to ripen in a natural environment for a minimum of three months. In the summer months, the chalets of the Alpine pastures are the locale of choice for making Fontina, while during the winter season, production moves to the creameries located in the lower areas of the Aosta Valley. Each cheese artisan has their own favorite place in which to age their Fontina — it can be in a cave, tunnel, grotto, cellar, etc. Basically, any place that can provide a nice, cool temperature that stays between 46 and 51 degrees Fahrenheit can be utilized as a ripening station for Fontina cheese. Even defunct military bunkers and old copper mines have been used! The end result is a rather large wheel of cheese, roughly 18 inches in diameter and about 4 inches thick, that weighs between 17 and 22 pounds. The younger Fontina wheels are more buttery and smooth than their more aged counterparts, which are drier and darker. As the cheese is allowed to age, its flavor increases in complexity, displaying earthy notes right along with a fruity and somewhat nutty taste and aroma. When it comes to authentic natural cheese produced in the Aosta Valley, Fontina is the only game in town, but there are plenty of similar cheeses on the market that have borrowed generously from Fontina’s name and reputation in order to garner a fan base. Fontina-style cheese is produced in several other countries as well, including Sweden, Denmark, France, Canada, and the United States. The Swedish version of Fontina has a pale yellow hue with a coating of red wax around the rind, and its flavor is slightly more tart than Italian Fontina. Danish Fontina has a shorter aging period, which influences its milder and creamier flavor, and it also features a red wax rind with rounded corners. Perhaps one of the most popular U.S.-based Fontina imitators is Roth Kase Fontina, a heat-treated cheese that hails from a creamery located in Monroe, Wisconsin. As mentioned earlier, similar brand names such as Fontella, Fontal and Fontinella have been developed to identify look-alike cheeses that are made by creameries in Italy’s Po Valley, but only Fontina val d’Aosta holds the title of genuine Italian Fontina cheese. This distinction is further evidenced by the mark of authenticity located on its rind — a seal that features an image of the Matterhorn, along with an inscription that reads “Fontina” across the bottom portion of the mountain. The rind also features a stenciled inscription that names the cooperative from which the cheese came. One of the most outstanding characteristics of Fontina cheese is its versatility, which is due in part to its complex yet well-balanced flavor profile. On one end, you can detect notes of wild mushrooms and honey, while at the same time there are hints of a fruity, nutty and buttery flavor that can complement a wide range of ingredients. Fontina is indeed an “anytime cheese,” as it can be consumed as a snack with celery or fruit, but it can also become the star of the dish in various fondue applications. Fontina also marries well with salami, ham, pastrami, and pâté, providing a depth of flavor that can take grilled or toasted sandwiches to another level. So if you’re looking for a way to add the “wow factor” to practically any dish that calls for cheese, Fontina should definitely be on your short list.